Let's start with the definition of Transitional lighting. Transitional lighting is neither Traditional nor Modern. It's a style between Contemporary and Traditional. OK, so what does that mean? Contemporary is similiar to modern (Modern is black and chrome, sleek straight lines, simple geometric design, and basically the 50's view of the space age) with a broader range of color and material, softer lines, and a more organic form. Traditional lighting is typically ornate with classic lines and made out of materials that never go out of style. They have a sense of tradition and heritage. Well, that explains it! No, not really, so let me give you some examples of Transitional lighting styles I often suggest to clients as they have form and fuction, interesting shapes, appointed features, beautiful finishes, and most importantly, longevity - they stand the test of time. Just a few more words and then some examples. Transitional fixtures fit into most homes because they appeal to both classic and modern styles with elements of both unless the home is specifically trying to be historic or ultra contemporary. They create a warm and inviting atmosphere. 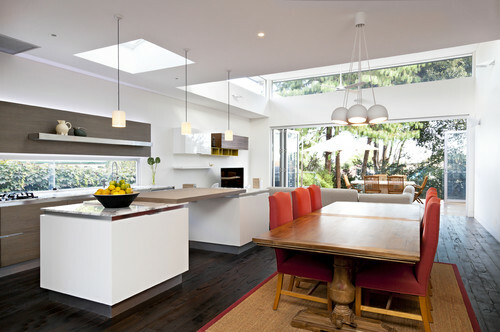 This kitchen is a good example of Transitional lighting. It's traditional with modern elements. When you look at style, Modern and straight Traditional are polar opposites. By adding elements of one style to the other, we create different styles. 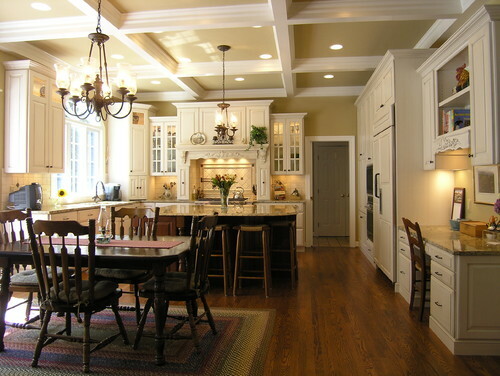 Your kitchen pendants are the fixtures you will view the most often in your home since we all know that everyone congregates in the kitchen, it's the hub and heart of the house. Decorative pieces are the signature item that speaks to your personality. Think about it: Recessed lighting is the backbone of any lighting design, so decorative separates your home from your neighbor. This would be a good area to budget a bit more. I will typically use two 10-inch pendants when my island is 5 feet or smaller, and two or three 14-inch pendants if my island is 7 feet or longer. High ceiling heights should also play into your decision dependin on ceiling heights. 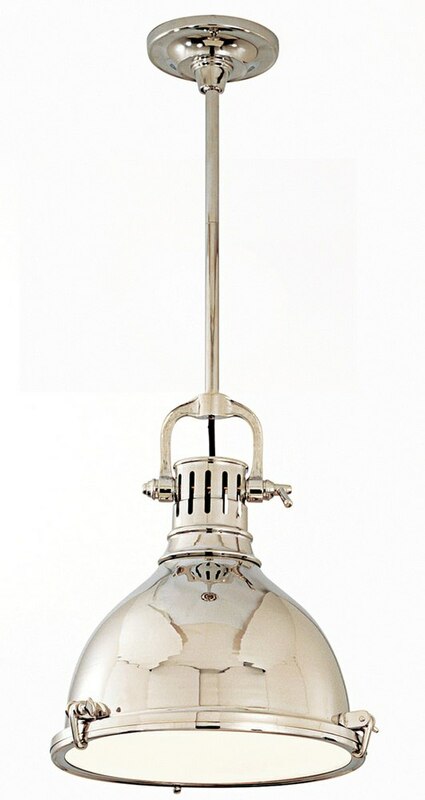 Height: 11.75" Width: 8.5" Canopy: 4.75"
The clean spherical shape of this Polished Nickel pendant adds minimalist appeal while successfully straddling multiple styles all in one fixture and is versatile for a range of homes. 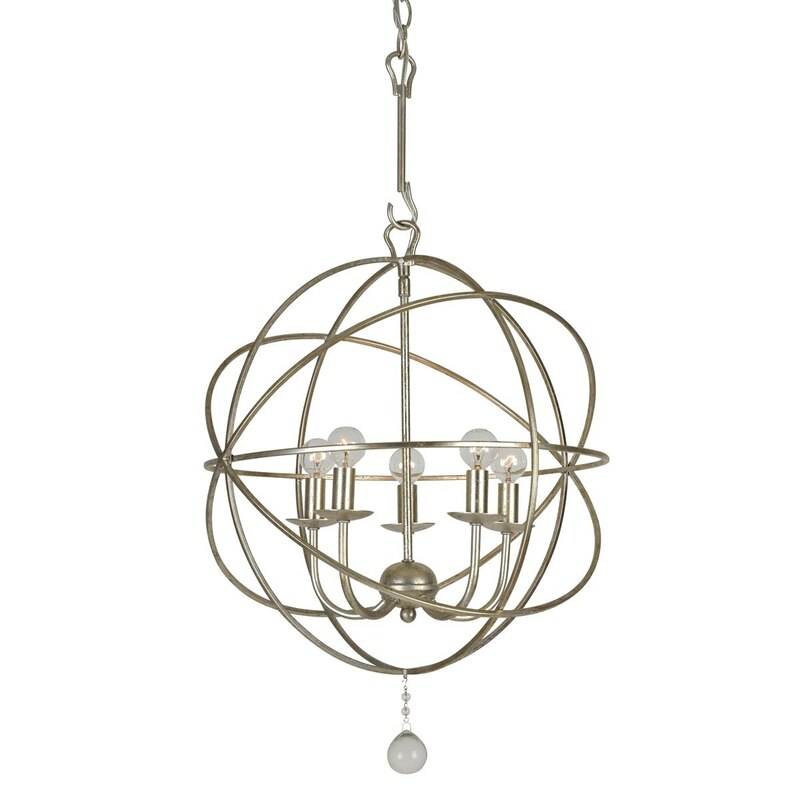 Everything the designer, Thomas O’Brien, incorporates into this piece is intentional; from the rivets dissecting the sphere to the square chain which globe suspends from gives interests and glamour to this simple fixture. The smaller of the two Hicks sizes retail for around $550 and comes in other combinations of finishes such as Bronze w/Antique Brass, Hand-Rubbed Antique Brass, plus Antique Nickel (not pictured). If your budget doesn’t accommodate this price range, and compromise is in order, I suggest a lovely alternative to you called The Cadence by Murray Feiss. This has a similar look to The Hicks and comes in two finishes only. The price is approximately $299. That’s almost half the price of the original and comes in matte black with dark antique brass finish plus polished nickel and brushed steel option. Hudson Valley has a transitional style called The Randolph 2622 and The Pelham 2212. The two fixtures are similar style but have a distinct difference. They are available in a variety of finishes and sizes. The Randolph with its white glass dome allows light to be emitted in a more general way, giving the perception of more light in the space as the light appears to illuminate 360 degrees, diluting the precision of the downward beam of the Pelham. The Pelham has a solid metal dome with a distinct downward beam giving a more precise control of light to illuminate your island. The distinct difference between the Randolph and the Pelham is the solid or opaque glass dome. Depending on the perception of the light, and the area you are illuminating will be how you make your selection. Both styles use 1-150W Max A19 bulb. 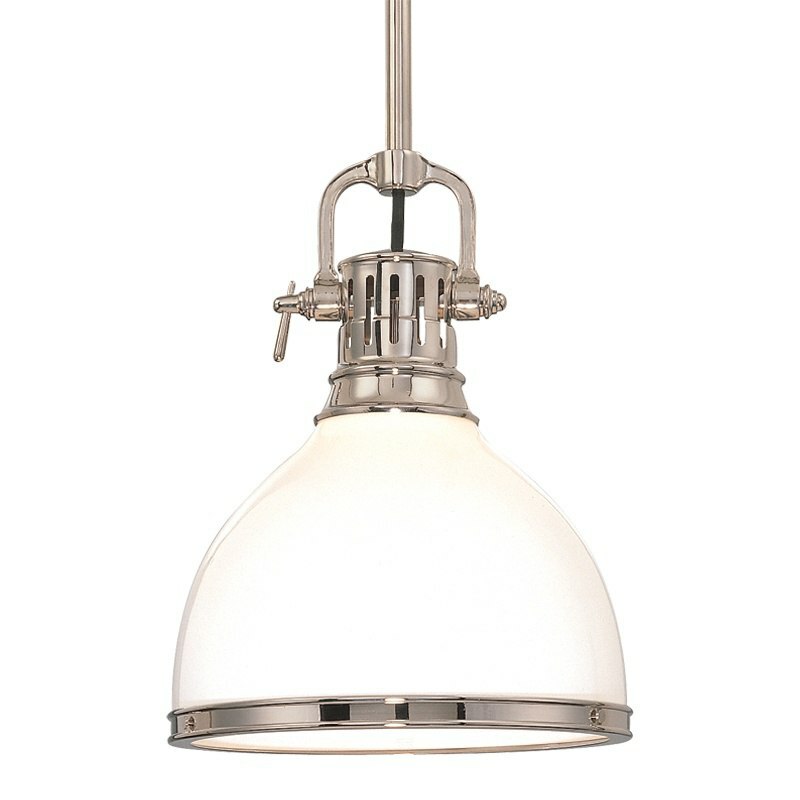 Whichever style suits your needs, the unique feature of this fixture which separates it from other lesser priced look-a-likes is the frosted lens cover on the bottom which conceals the light bulb. You won’t have the glare from looking directly into a bright bulb no matter where you sit or view your viewing angle. Quoizels 8” Grant Pendant and Feiss’ Parker Place both sell for approximately $225 and have the same or similar look of the Randolph EXCEPT the lamp is visible from below as there is no shield concealing the bulb on the bottom of the dome. This may look traditional to some but it has some beautiful lines and optional glass design choices in multiple finishes that put Classic and Timeless back into the equation. It’s not exactly Historic but an updated interpretation of our New England staple. The clear glass allows easy viewing from one side of the space to the other, without a solid element blocking your line of sight. It is especially attractive when there is a large window with views of the ocean or skyline. This is a fixture you will never need to replace as it incorporates itself into any décor. The bell jar is something you can pass down to the next generation since young and old alike find this fixture graceful and timeless with any décor. Fourthly, don’t overlook Hubbardton Forge for their artistic, handmade in the USA (Vermont) hand forged iron fixtures. Hubbardton Forge has been making fixtures here in New England for over 50 years, and recently employed additional R+D associates taking their traditionally designed fixtures to a whole other level. You can choose over 10 finishes for any of the Hubbardton fixtures. They are lovingly handmade to order. Prices range from $325-$690 depending on the intricacy of the design and material. The 8-Link pendant is on the higher end, and has multiple pattern designs to choose, but compared to other pendant Mfg’s they are certainly in the arena on price, and they are a New England based company who we are proud to support. So, for my fifth selection for this blog, and there are so many, I shall choose Crystorama’s Solaris 3 light 9224 at $218. I selected this pendant which has many other larger sized matching chandeliers (i.e. Solaris 24” 9226 at $359). It comes in a few finish options, Old Silver and Oil Rubbed Bronze and White. This is a great size for an island pendant, and you can’t balk at the price. You may think this is trendy but spherical shapes have been used in residential kitchens for years starting with a plain glass globe and candle for a light source. Multiple sizes, open design for unobstructed views and reasonable price make this a winner. You may not like any of these pendants. Just remember, almost every interior is transitional with elements of both modern and traditional in the same room. For an island, the most common is 2 large or three small pendants. You want a bigger light for a taller ceiling. After measuring properly, just pick a style you like. Get the Yale Kitchen Lighting Buying Guide with features, how to's, and tons of pictures to assist you in lighting your kitchen. Well over 245,000 people have read a Yale Guide. How Many Pendants Do You Hang Over A Kitchen Island? Amy Zuckerman is a Lighting and Plumbing Sales Consultant at Yale Appliance + Lighting. Amy has over 30 years of experience in the lighting and plumbing industry. When she’s not at work, you can find her going for rides in the convertible with her husband Al, and dog, diamond.